Transport Layer Security (TLS) and Secure Socket Layer (SSL) are cryptographic methods to encrypt data at the Transport Layer from end to end. These security protocols are used to secure application protocols such as HTTP, FTP, SIP, SMTP, NNTP, and XMPP. VOCAL’s software library provides Transport Layer Security version 1 (TLSv1) and Secure Socket Layer version 3 (SSLv3). TLSv1 and SSLv3 operate at a layer between the transport and application layers. In this position multiple application layer protocols can be supported by securing the application data before sending it to the transport layer. Contact us to discuss recommended algorithms to meet your network application requirements. These are used to create the security parameters used by the record layer. Alert Protocol – This protocol allows for the use of the Alert message, these convey what the alert is as well as the severity. Record Protocol – This protocol using, the cipher suite information, takes the application data and encrypts it before passing it to the transport layer. 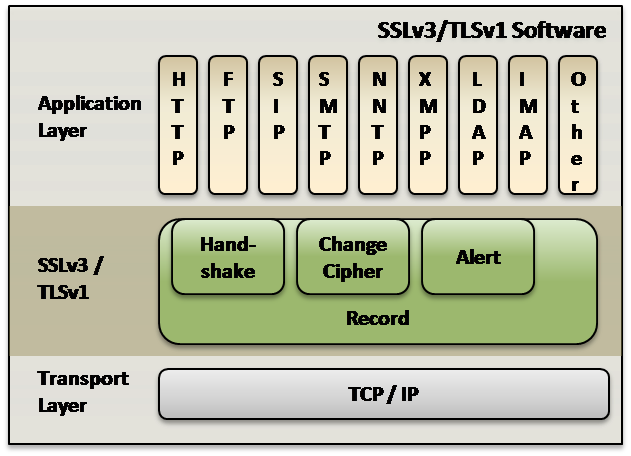 TLSv1 and SSLv3 make use of multiple cryptographic algorithms that are specified in the cipher suite. Each cipher suite designates a Key Exchange algorithm, Cipher algorithm and MAC algorithm. RSA and Diffie-Hellman (DH) can be used for the key exchange. RC4, 3-DES and AES are algorithms that can be used for encryption. MAC algorithms are Message Digest 5 (MD5), SHA-1, and SHA-256. The table below shows the construction of different cipher suites. Advances in technology may affect the level of security provided by the different suites. Please contact us for recommended configurations.